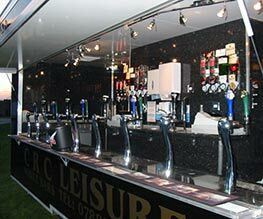 Whatever your beer dispense needs, be it technical assistance or the setting up of a service point in the middle of a field – CRC Leisure & Technical are the firm to call. We have a reputation for getting the job done right and getting it done efficiently. C.R.C. Leisure & Technical is relied on by professionals in the leisure industry and individuals planning events, it is also the technical partner of B.S.B. 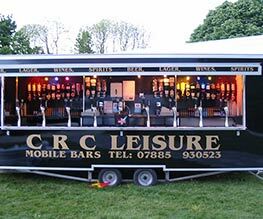 Mobile Bars; our well known and established mobile bar operation that also caters to private functions, music events, festivals, fetes and corporation events. With 20 years technical experience behind us, we can handle any problem or logistical situation that relates to beer dispense, equipment hire and bar operation. 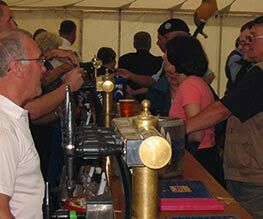 Should you be having a corporate do, a private party or a large public gathering and need to set up beer pulling equipment, we are the people to advise and help you. 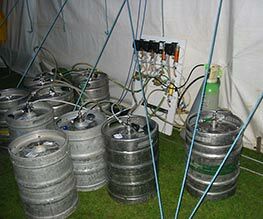 Anything from 1 keg in your back garden to 100 kegs in the middle of a field or a party in a stately home. Our business is about getting the technical side of beer dispense just right, so that your event flows smoothly. We have fully equipped trailers 20 feet long with 18 dispense pumps, refrigeration, generators and all you could require for a bar operation. These trailers as well as our fully equipped mobile bars can be set up and operated by us at your event, or hired out for your own use and come complete with technical support. Do call, write or email for advice or assistance with your beer equipment or to arrange the setting up of a bar or hire of equipment– our friendly and professional team will be delighted to help.